Embark on a journey to Know Better Hommus. We’ve been making (and spelling) our Hommus the same way since the beginning. Simple, great tasting and good for you. If it works, don’t change it. No one makes Hommus the way we do. 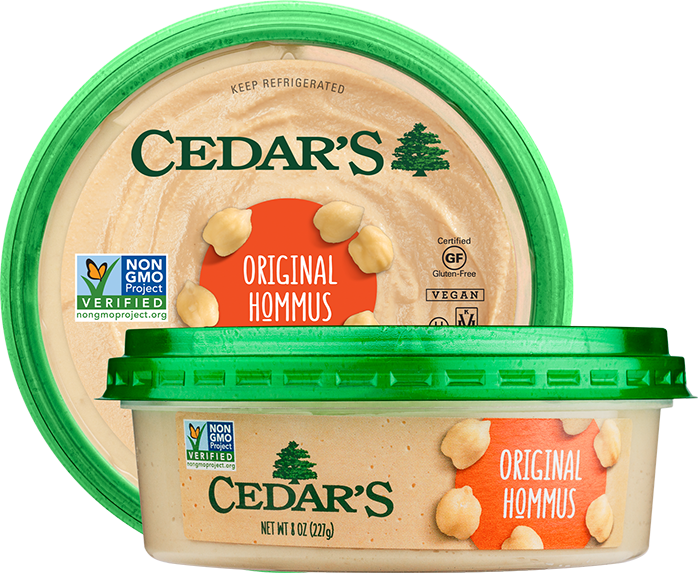 Our unique process allows us to deliver the freshest, most dippable Hommus you’ll ever taste—without the preservatives. We never changed the way we make it. Or spell it. Our ingredients are as pure as our process. From the chickpeas, to the tahini, to the spices we use—everything we add makes our Hommus taste better and is better for you. This is the Hommus that started it all. While we pride ourselves on offering bold and imaginative flavors, Cedar’s Original will always be at the core of what we do. Our favorite recipes straight from Cedar’s Chickpea Kitchen. When in doubt, dip it out. These flavors will leave you shell-shocked. The perfect parfait, right this way. Knot complicated. Just simple and satisfying. We say potato. You say um…woah.